PULLMAN, Wash. – How would Herbert Niccolls, the 12-year-old who shot and killed Asotin County’s sheriff in 1931, have fared in today’s criminal justice system? A new exhibit at Washington State University Libraries will prompt this and other questions related to the treatment of juvenile offenders past and present. 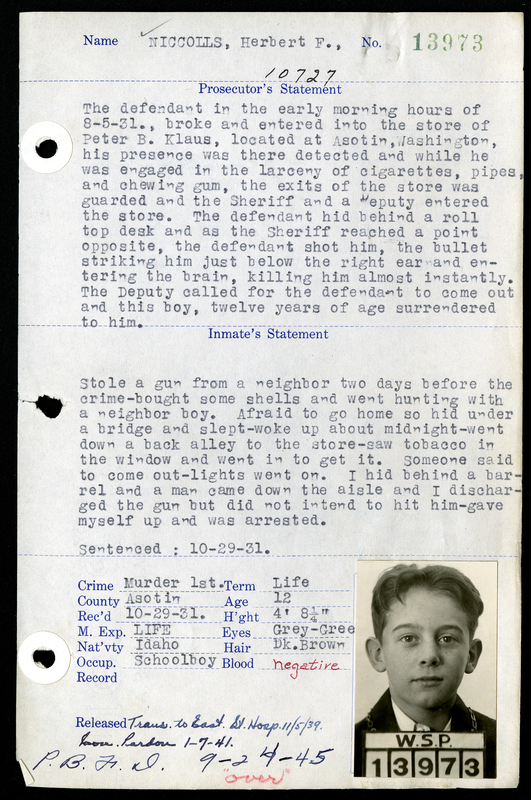 “The Case of the 12-year-old Sheriff Killer: Herbert Niccolls and the Washington Justice System” opens Wednesday, Nov. 18, with a reception 3:30-5 p.m. in Manuscripts, Archives and Special Collections (MASC) on the ground floor of Terrell Library. It will run through March 26. MASC hours are 8:30 a.m.-4:30 p.m. Monday-Friday. The exhibit, curated by WSU manuscripts librarian Cheryl Gunselman and designed by graphic designer Amy Grey, relates to this year’s common reading book, “Just Mercy,” written by Bryan Stevenson, who created the Equal Justice Initiative to offer legal representation to indigent defendants and prisoners. Read more at http://CommonReading.wsu.edu. MASC collections from two of the case’s major players provide intriguing glimpses of the crime, trial and its aftermath: Elgin V. Kuykendall, the circuit court judge who presided over Niccolls’ trial, and Clarence Martin, the Washington governor who signed Niccolls’ conditional pardon from Washington State Penitentiary when he was 21. The Asotin County Museum and Washington State Archives also contributed reproductions of key documents and photos. 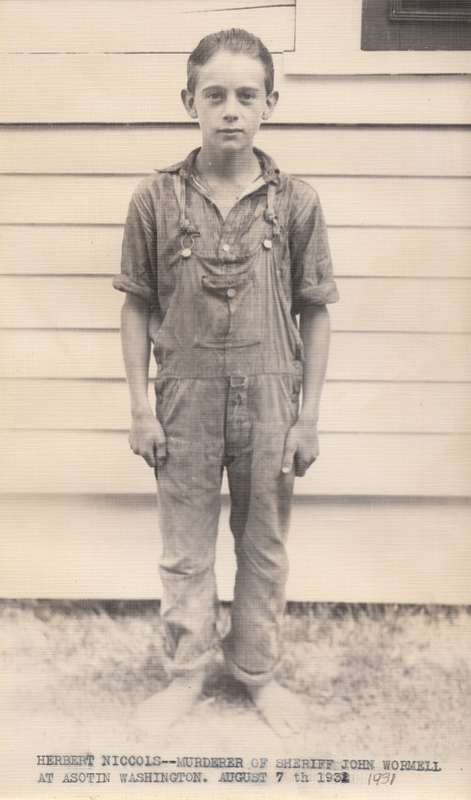 Before 1 a.m. on Aug. 5, 1931, Herbert Niccolls, barefoot and clad in a thin shirt and threadbare overalls, broke into Peter Klaus’ People Supply Store in Asotin, Wash., to steal tobacco and gum. Tucked inside his overalls was a gun he had taken from a playmate’s father. Minutes later, Asotin County Sheriff John Wormell, his deputies and the store owner entered the shop, alerted to the burglary by a neighbor, and ordered the culprit to come out. Niccolls crouched behind a vinegar barrel and some boxes, and as the sheriff neared his hiding place, the boy shot Wormell in the head, killing him. First regional and then national reporters swarmed to eastern Washington to cover the event and trial, adding fuel to an already contentious discussion of juvenile delinquency in the country. Niccolls’ age and history of theft and arson revealed at trial seemed to underscore the point. Bad seed or bad environment? During the trial, the public learned that Niccolls had been involved in criminal activities from the age of 8, stealing jewelry, money, a teacher’s pocketbook, cars and more. He showed little remorse about shooting Wormell, a well-respected lawman, civic leader and state legislator. One prosecution witness labeled Niccolls “a constitutional psychopath” who presented a menace to society. People also learned about Niccolls’ troubled family history of poverty and mental illness. 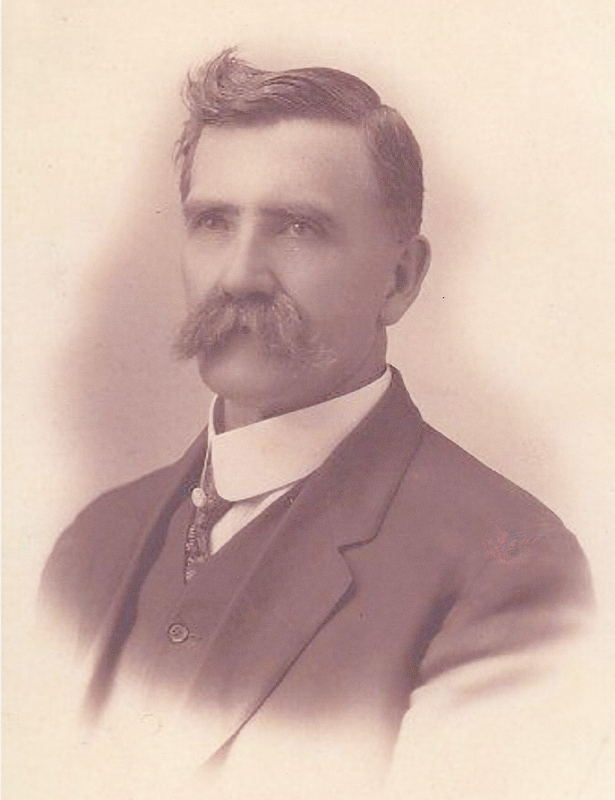 Parents Bert and Hazel Niccolls had nine children; after the birth of the youngest child, Bert shot and killed Hazel’s sister-in-law and tried to kill Hazel. Bert was sent to the Orofino State Hospital for the Insane, and Hazel, with no financial means to care for her large family, gave up custody of her four oldest sons, including Herbert Niccolls. Speculation about the child’s innate criminal tendencies versus his tragic upbringing made the case even more difficult as the court deliberated on whether he deserved to hang for his crime or be sent to prison for life. On Oct. 29, 1931, Niccolls was convicted of first-degree murder. The jury sentenced him to life in the state penitentiary in Walla Walla, and Judge Kuykendall further specified that Niccolls would be educated and kept separate from the adult inmate population. 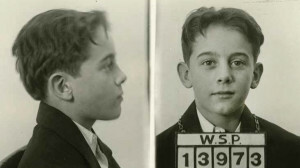 At 12, the “barefoot-boy murderer” was the youngest person on record in the state to receive a life sentence. Flanagan and Seattle progressive reformer Armene Lamson appealed to Washington Gov. Roland Hartley to parole Niccolls to Boys Town; Flanagan even took his campaign to radio listeners and other national media. But Hartley, fearing his constituents would believe he was soft on crime, did not parole Niccolls. That would be left to his successor, Gov. 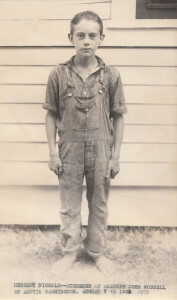 Clarence Martin, and Niccolls would not receive clemency for nine years. Inmate 13973, as Niccolls was known, thrived in prison. The wardens, prison librarians and a few trusted inmates supervised his education, and he received his high school diploma in 1938 and took correspondence courses from Washington State College. Niccolls had a cell to himself, was segregated from other inmates, exercised alone with prison guards watching him and took meals with prison officials. But Niccolls’ special treatment earned him the envy of prisoners not as fortunate. The envy grew as Niccolls turned 20, older than some of the inmates entering the penitentiary. He couldn’t be protected any more. Gov. 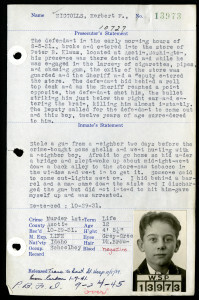 Martin arranged for Niccolls to be evaluated at Eastern State Hospital near Spokane, Wash., for possible release. Niccolls stayed for 14 months, learning to drive, taking supervised trips to Spokane and working in the hospital library. But Martin’s term of office was about to expire. One of the governor’s last official acts was to grant Niccolls a conditional pardon on Jan. 7, 1941. He also arranged for Niccolls to work in Seattle at a machine shop. Niccolls didn’t succeed initially, losing the job, but he found accounting work at a Tacoma shipyard, a position that suited his skills better. Four years later, facing layoff from the shipyard after World War II ended, Niccolls sought and received a release from parole supervision for a job in the accounting department at 20th Century Fox in Hollywood. He stayed in California and at the studio for the remainder of his life, marrying and fathering a son who never knew about his father’s past until Bartley contacted the family about writing Niccolls’ story. Niccolls died in 1983, keeping a clean record after his release from prison. 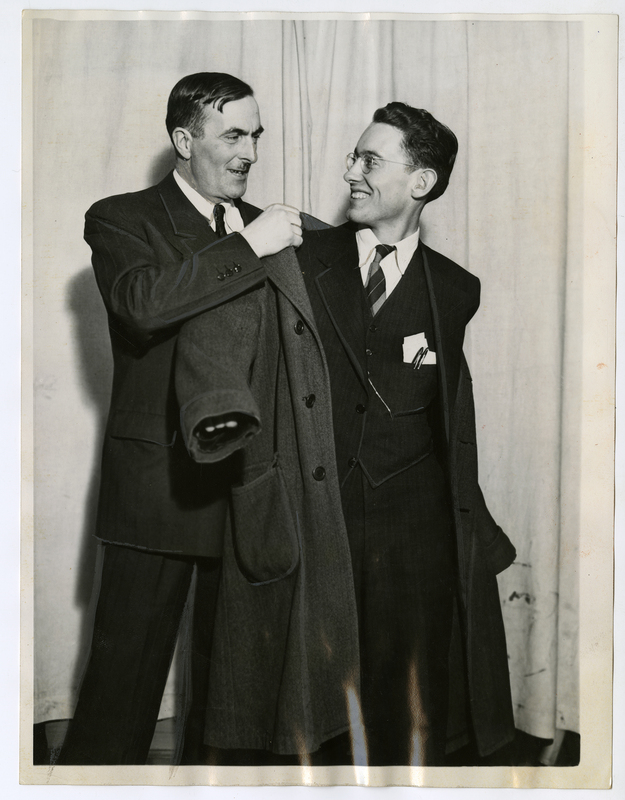 But he struggled with the knowledge that he had killed John Wormell in 1931. A memorial to Wormell was dedicated in Asotin in 2011, 80 years after his murder. A law enforcement veteran of 35 years, Wormell was survived by a wife, three sons and a daughter. Several of his descendants followed in his footsteps by becoming officers themselves.